With you Bark subscription, you have unlimited children, devices, and accounts you can monitor. We know some kids may get their first phone or an older sibling's old phone and you're wondering how to adjust Bark to the new change. Here you will see the devices that are associated with each child. To remove a device from monitoring, you can simply change the child's name to Not Monitored from the drop-down menu underneath the device. Even though you will continue to see the device there, as long as it says Not Monitored, it will no longer be monitored by Bark. 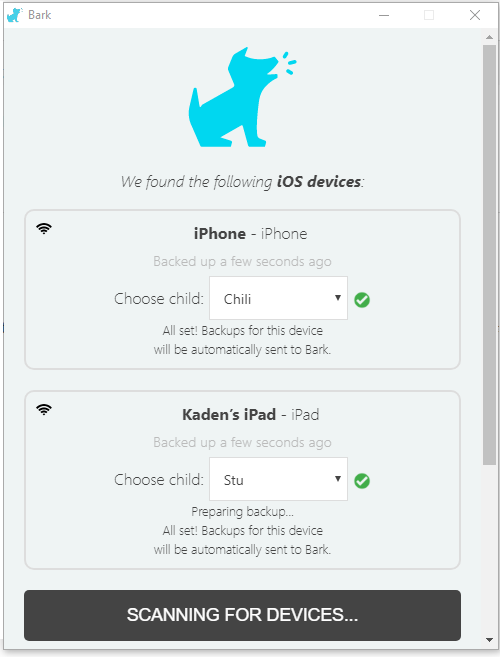 To switch devices between children, you can click the drop-down menu underneath each device and select the appropriate child's name. For changes to take effect, click on the Bark dog in your taskbar and select Attempt Backup Now.